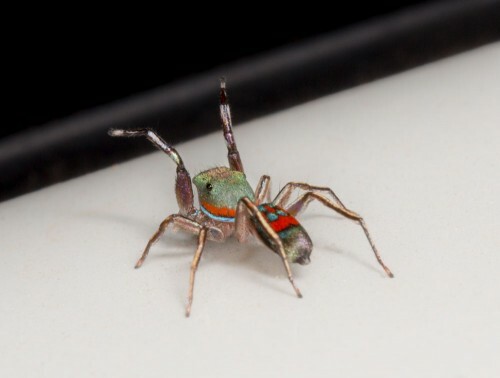 On that rainy day in my car shed I found this Metallic jumper on my car bonnet. 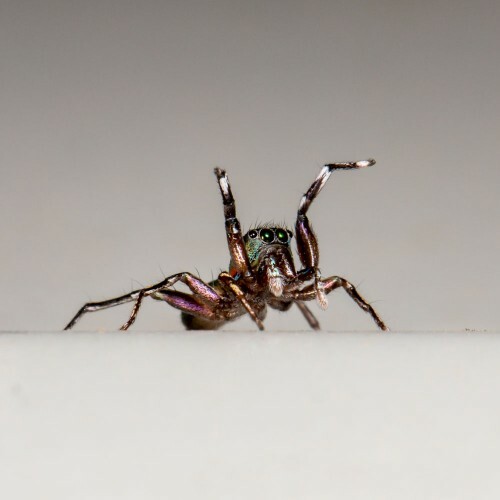 As I went close to inspect it, I noticed this jumping spider has a very unusual “hands up” posture of raising the front two legs. I recalled the discussion I read of Spider India group regarding Siler species hitherto unrecorded from India. This was posted by Thomas V in 2010. 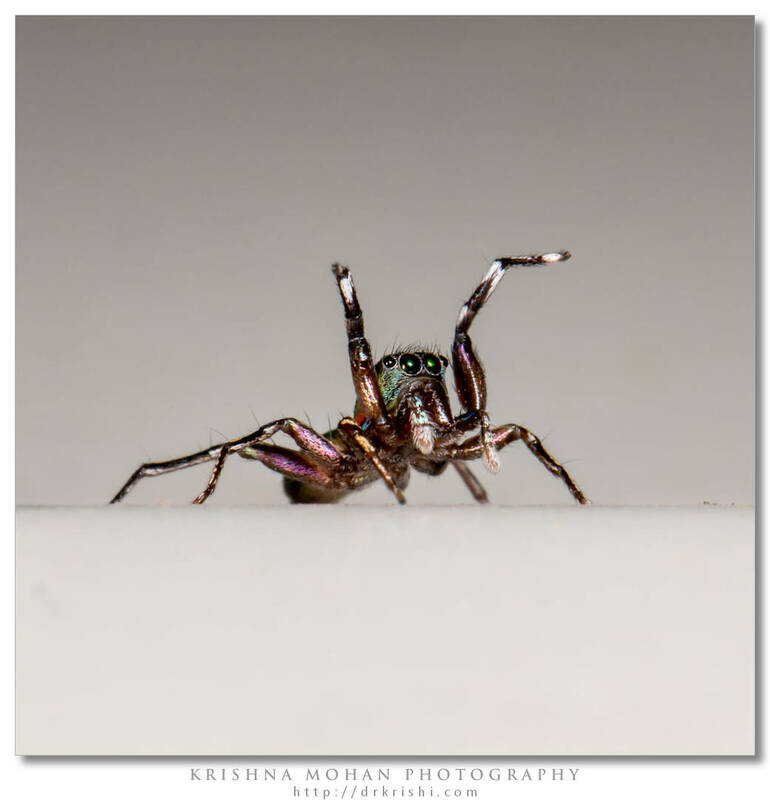 He subsequently posted on his excellent blog Nature Magnified – A Colourful Jumping Spider – Siler semiglaucus. Information available on Internet on this beautiful spider is so sparse, even Wikipedia does not list it. I used my Canon EOS 5D Mark III with Canon EF 100mm f/2.8L Macro IS USM fitted with Canon MT-24EX macro twin light flash. To get largest depth possible I used f/16 aperture at ISO 100. Having pearl white finish car body paint acted both as advantage as well as disadvantage. 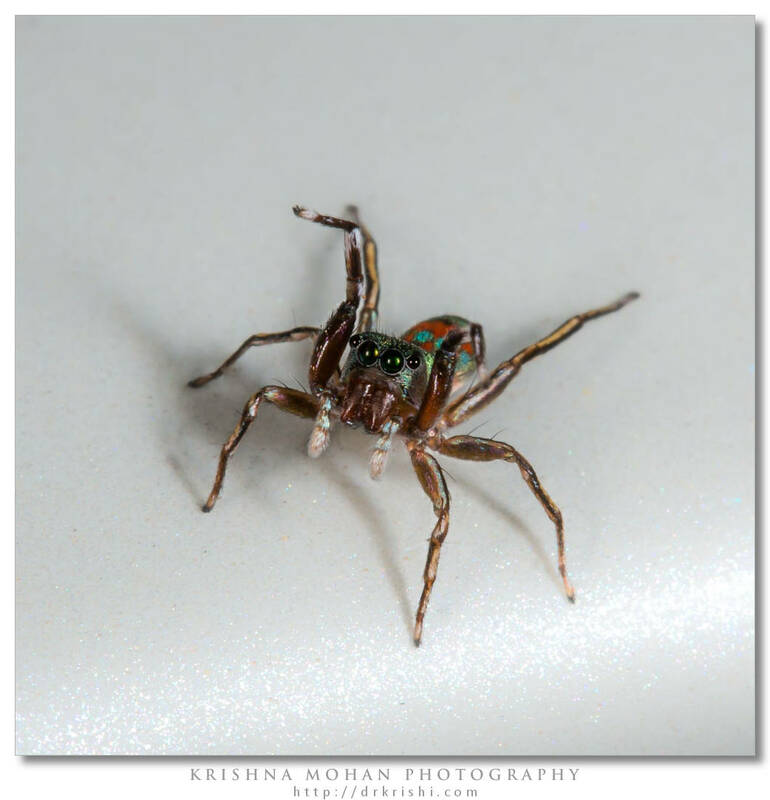 It was reflecting light in unusual angle and an agile spider was running all along the car top. Some of my photos were spoiled by too much of specular reflection from the reflective body paint. I had to catchup with its speed, fix my position and get it in focus. AI servo mode and rapid focusing speed of 5D Mark III came as a boon. I had earlier tried with my 5D mark II on jumping spiders and failed miserably owing to their agility and speed with which they move. They are capturable only when they freeze. 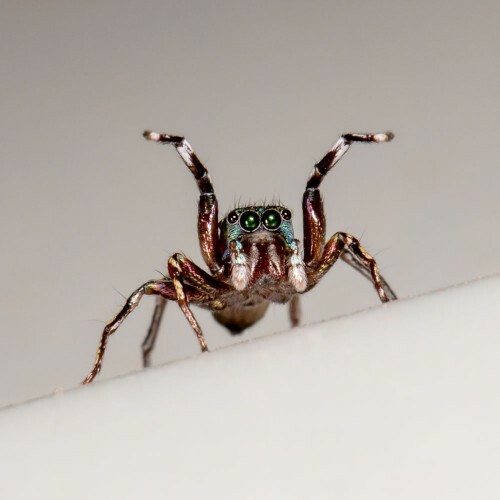 The Metallic jumper spider (Siler semiglaucus) belongs to the family of jumping spiders (Salticidae). The color pattern of other species of the genus Siler can vary greatly, but Siler collingwoodi which is present in the Hong Kong and China region is very similar in color and size to this spider. Simon E. who originally described this spider in 1901 and all the subsequent papers explain the distribution from Sri Lanka to Philipines. It was not mentioned in any literature as to be present in Indian subcontinent until Mathew MJ in 2007 described in his PHD thesis submitted to Forest Research Institute Dehra Dun. Male is around 4 to 5 millimeters and females are usually longer at about 6 millimeters. 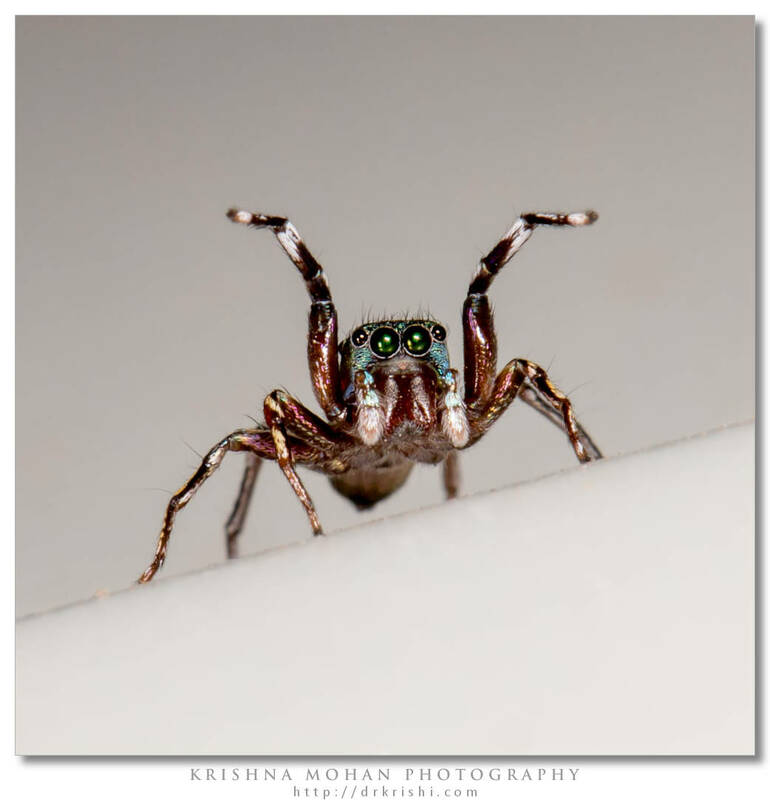 Like all jumping spiders (Salticidae) this spider too have the most powerful eyes which are well characterized. On the front there are four headlamp like enlarged eyes. Other four eyes are behind them in two rows. 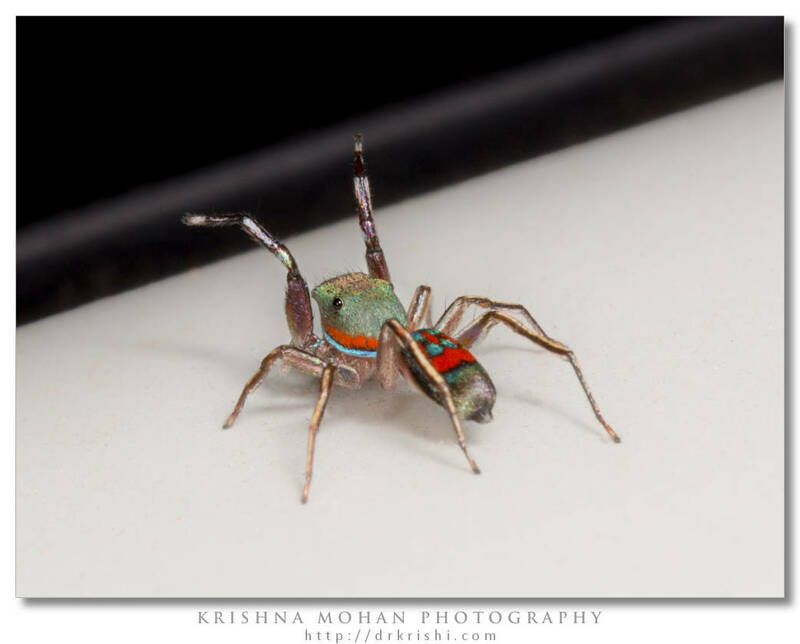 This is a small bright colorful, sometimes iridescent spider. Some specimens have dense, colorful and shimmering hair, making them look particularly attractive and striking. 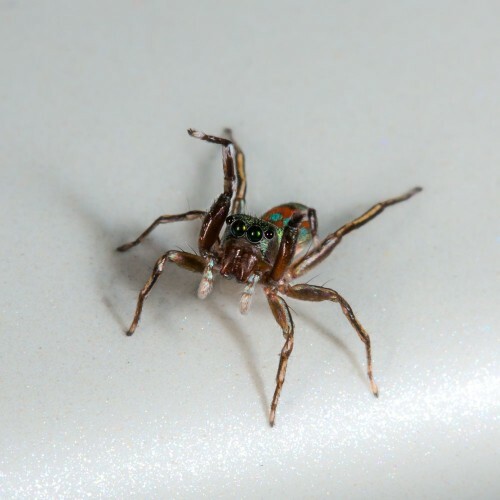 Male with high, slightly slender, compact cephalothorax having uniform bluish-green color. On the side of cephalothorax there are two bands, one white and the other orange. Male and female almost look alike except that the males possess a ring on the tibia of leg I. During walking, males often stop a while and repeatedly raise the robust first legs and wave them in the air. Spherical abdomen is also lustrous bluish-green in color with bright orange patches. The one pictured here seems to be the male spider. The spider is very lively and quick, it is diurnal and very heat-and sun-loving. To catch prey, the spider weaves no web, but recognizes the victim with its large sharp eyes. It jumps at the appropriate moment and paralyzes with one bite. Before the jump it attaches a security thread on the floor which on the one hand, avoid being picked up by a larger predator and on the other hand help to return to original position with lightning speed. Siler semiglaucus has a wide distribution: Nepal, India, Sri Lanka, China, Philippines, Singapore and Sumatra. Furthermore, the spider is also seen in Malaysia, Japan and the east of Papua New Guinea. They live among the bushes, on plants, especially on large-leaved plants such as ginger and coconut palms. The spider can often be found soaking up the sun on the leaves or resting in a leaf. They make silken retreat in rolled dried leaves especially leaf spikes of coconut trees. 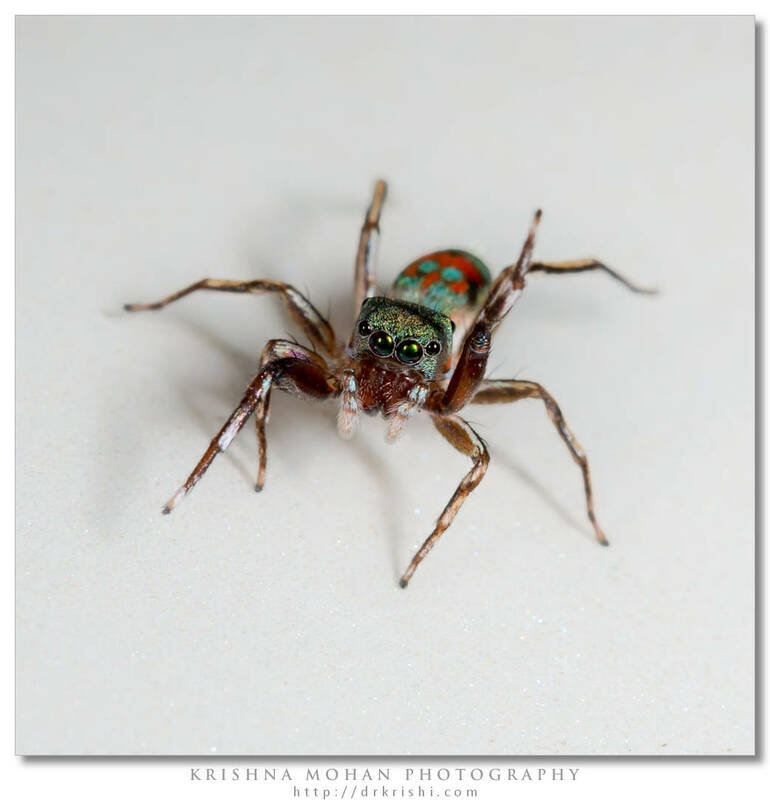 Like all species of the family of jumping spiders (Salticidae), these spiders feed on insects (Insecta). Spider lurks in exposed places on their prey and ambush. The sense of sight plays an extraordinary role. The spider can target the prey from a distance of several centimeters and deliberately jump quite far to catch them. Mostly they prey on flies, butterflies and their caterpillars. As with all other spiders, the males reach sexual maturity before females and set out to find a suitable partner. Before mating, the female is courted with characteristic courtship dance. The male stretches up his front legs, which contribute to the sexually mature males a signal color, and waves the first pair of legs. These first pair of legs now have a bottle brush like hair growth. Male moves back and forth in front of the female until both legs touch her face and neck. During this period female stands still, then proceeds to mating. The female after pairing builds an over sized silk cell in which it lays her eggs, and guards it. Guarding usually lasts until the second moult, as the young spiders in their first molt are almost blind, and only after the second molt they will have fully developed eyes. Nice write up Kirsh, and amazing photo’s as always. Thank you for sharing very informative & interesting details of this species..enjoyed reading it. Beautiful spider & pictures.